The FAIR project (Fostering Access to justice for Immigrant children’s Rights) was a two-year long project, which aimed at strengthening access to justice for migrant children in the EU. Migrant children in the EU face violations of their human rights every day. Lack of access to their families, to information, guardians and legal assistance, lack of access to housing or education, unlawful detention – are few examples of what the children suffer. VI. Practical handbook for lawyers when representing a child. These materials have been used in national trainings for lawyers organised by the ICJ-EI in Spain, Italy, Greece, Malta, Bulgaria, Ireland and Germany and include also practical training tools, such as case studies and warm-up questionnaires to guide possible future trainings. International Commission of Jurists – European Institutions (Lead Partner), Greek Council for Refugees (GCR) (EL), aditus foundation (MT), Fundacion Raices (ES), Bundesfachverband Unbegleitete Minderjährige Flüchtlinge e.V. (B-UMF) (DE), Legal Clinic for Immigrant and Refugees (LCIR) (BG), Immigrant Council of Ireland (ICI) (IR), Scuola Superiore Sant’Anna (SSSA). Co-funded by the Rights, Equality and Citizenship (REC) Programme of the European Union. Co-funded by the Rights, Equality and Citizenship (REC) Programme of the European Union and the Open Society Institute Budapest Foundation, and implemented in cooperation with the AIRE Center, Child Rights Connect, and the Associazione per gli Studi Giuridici sull’Immigrazione (ASGI) (Italy). 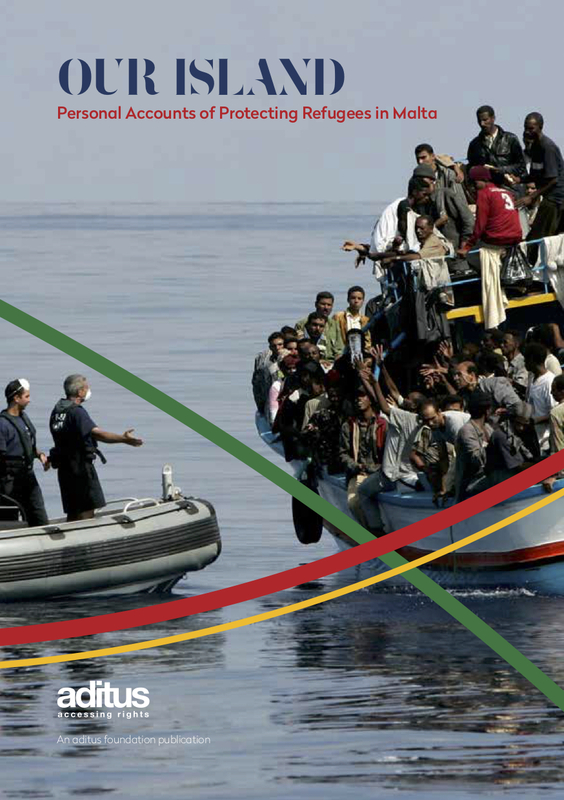 Today European Network on Statelessness is launching a new online tool, Statelessness Index, for assessing how different European countries – including Malta – protect stateless people and what they are doing to prevent and reduce statelessness. The tool is aimed at sharing good practices as well as raising awareness or focusing advocacy on areas that need improvement. It is the first tool that provides comprehensive and accessible comparative analysis on statelessness in different countries in Europe. Comparing country specific information has been made easy as the index is divided into five themes: international and regional instruments, statelessness population data, statelessness determination and status, detention and prevention and reduction. Moreover, assessing country specific information has been made easy by categorising the information to range from the most negative to the most positive. You can find Malta in the index together with France, Germany, Macedonia, Moldova, The Netherlands, Poland, Serbia, Slovenia, Switzerland, United Kingdom, and Ukraine. More countries will be added later as the index is still in its pilot phase. aditus foundation is the country expert for Malta, with the report compiled by our Director, Neil. According to him the most crucial aspect of statelessness in Malta is the very limited protection that Malta provides for stateless people. Even though Malta is party to some relevant international and regional human rights treaties, it is not party to any of the core statelessness conventions, such as the 1954 Convention relating to the Status of Stateless Persons and the 1961 Convention on the Reduction of Statelessness. Another issue to be raised is the one of detention of stateless people. Maltese law provides some protections against arbitrary detention, but rights afforded to people detained for removal purposes, for example, are very limited. Moreover, Malta has no mechanism to identify and determine statelessness, and no stateless protection status. Data on the stateless population is therefore limited, with figures available only for the very small number of stateless people who acquire Maltese citizenship and refused asylum-seekers recorded as ‘nationality not known’ who cannot be returned and may or may not be stateless. To learn more about statelessness in Malta and how Malta compares to other European countries visit the Index, or get in touch with us. You can also see our other work on statelessness here. We’d like to thank UNHCR Malta for assisting us in our research and drafting. This post was prepared by Emma Pahkala, Intern at aditus foundation.